The human circulatory system is responsible for delivering food, oxygen, and other needed substances to all cells in all parts of the body while taking away waste products. The circulatory system is also known as the cardiovascular system, from the Greek word kardia , meaning "heart," and the Latin vasculum , meaning "small vessel." The basic components of the cardiovascular system are the heart, the blood vessels, and the blood. As blood circulates around the body, it picks up oxygen from the lungs, nutrients from the small intestine, and hormones from the endocrine glands, and delivers these to the cells. Blood then picks up carbon dioxide and cellular wastes from cells and delivers these to the lungs and kidneys, where they are excreted. The adult heart is a hollow cone-shaped muscular organ located in the center of the chest cavity. The lower tip of the heart tilts toward the left. The heart is about the size of a clenched fist and weighs approximately 10.5 ounces (300 grams). A heart beats more than 100,000 times a day and close to 2.5 billion times in an average lifetime. The pericardium—a triple-layered sac—surrounds, protects, and anchors the heart. Pericardial fluid located in the space between two of the layers reduces friction when the heart moves. The heart is divided into four chambers. A septum or partition divides it into a left and right side. Each side is further divided into an upper and lower chamber. The upper chambers, the atria (singular atrium), are thin-walled. They receive blood entering the heart and pump it to the ventricles, the lower heart chambers. The walls of the ventricles are thicker and contain more cardiac muscle than the walls of the atria. This enables the ventricles to pump blood out to the lungs and the rest of the body. The left and right sides of the heart function as two separate pumps. The right atrium receives blood carrying carbon dioxide from the body through a major vein, the vena cava, and delivers it to the right ventricle. The right ventricle, in turn, pumps the blood to the lungs via the pulmonary artery. The left atrium receives the oxygen-rich blood from the lungs from the pulmonary veins, and delivers it to the left ventricle. The left ventricle then pumps it into the aorta, the major artery that leads to all parts of the body. The wall of the left ventricle is thicker than the wall of the right ventricle, making it a more powerful pump, able to push blood through its longer trip around the body. One-way valves in the heart keep blood flowing in the right direction and prevent backflow. The valves open and close in response to pressure changes in the heart. Atrioventricular valves are located between the atria and ventricles. Semilunar valves lie between the ventricles and the major arteries into which they pump blood. People with a heart murmur have a defective heart valve that allows the backflow of blood. Artery: Vessel that transports blood away from the heart. Atherosclerosis: Condition in which fatty material such as cholesterol accumulates on artery walls forming plaque that obstructs blood flow. Atrium: Receiving chamber of the heart. Capillary: Vessel that connects artery to vein. Hormones: Chemical messengers that regulate body functions. Sphygmomanometer: Instrument that measures blood pressure in millimeters of mercury. Vein: Vessel that transports blood to the heart. Ventricle: Pumping chamber of the heart. The heart cycle refers to the events that occur during a single heartbeat. The cycle involves systole (the contraction phase) and diastole (the relaxation phase). In the heart, the two atria contract while the two ventricles relax. Then, the two ventricles contract while the two atria relax. The heart cycle consists of a systole and diastole of both the atria and ventricles. At the end of a heartbeat all four chambers rest. The average heart beats about 75 times per minute, and each heart cycle takes about 0.8 seconds. the heart and branch into smaller ones that reach out to various parts of the body. These divide still further into smaller vessels called arterioles that penetrate the body tissues. Within the tissues, the arterioles branch into a network of microscopic capillaries. Substances move in and out of the capillary walls as the blood exchanges materials with the cells. Before leaving the tissues, capillaries unite into venules, which are small veins. The venules merge to form larger and larger veins that eventually return blood to the heart. The walls of arteries, veins, and capillaries differ in structure. In all three, the vessel wall surrounds a hollow center through which the blood flows. The walls of both arteries and veins are composed of three coats, but they differ in thickness. The inner and middle coats of arteries are thicker than those of veins. This makes arteries more elastic and capable of expanding when blood surges through them from the beating heart. The walls of veins are more flexible than artery walls. This allows skeletal muscles to contract against them, squeezing the blood along as it returns to the heart. One-way valves in the walls of veins keep blood flowing in one direction. The walls of capillaries are only one cell thick. Of all the blood vessels, only capillaries have walls thin enough to allow the exchange of materials between cells and the blood. Blood pressure is the pressure of blood against the wall of an artery. Blood pressure originates when the ventricles contract during the heartbeat. It is strongest in the aorta and decreases as blood moves through progressively smaller arteries. A sphygmomanometer (pronounced sfigmoe-ma-NOM-i-ter) is an instrument that measures blood pressure in millimeters (mm) of mercury. Average young adults have a normal blood pressure reading of about 120 mm for systolic pressure and 80 mm for diastolic pressure. Blood pressure normally increases with age. Blood is liquid connective tissue. 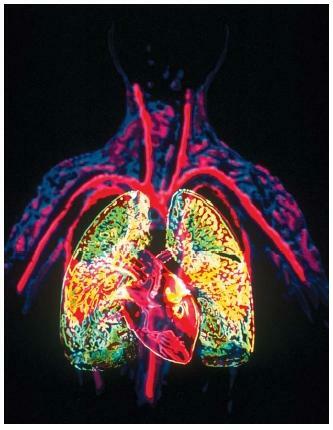 It transports oxygen from the lungs and delivers it to cells. It picks up carbon dioxide from the cells and brings it to the lungs. It carries nutrients from the digestive system and hormones from the endocrine glands to the cells. It takes heat and waste products away from cells. It protects the body by clotting and by fighting disease through the immune system. Blood is heavier and stickier than water, and has a temperature in the body of about 100.4°F (38°C). Blood makes up approximately 8 percent of an individual's total body weight. A male of average weight has about 1.5 gallons (5.5 liters) of blood in his body, while a female has about 1.2 gallons (4.5 liters). Blood is composed of plasma (liquid portion) and blood cells. Plasma, which is about 91.5 percent water, carries blood cells and helps conduct heat. The three types of cells in blood are red blood cells (erythrocytes), white blood cells (leukocytes), and platelets (thrombocytes). More than 99 percent of all the blood cells are red blood cells. They contain hemoglobin, a red pigment that carries oxygen, and each red cell has about 280 million hemoglobin molecules. White blood cells fight disease organisms by destroying them or by producing antibodies. Platelets bring about clotting of the blood. Circulatory diseases. Two disorders that involve blood vessels are hypertension and atherosclerosis. Hypertension, or high blood pressure, is the most common circulatory disease. In about 90 percent of hypertension sufferers, blood pressure stays high without any known physical cause. Limiting salt and alcohol intake, stopping smoking, losing weight, increasing exercise, and managing stress all help reduce blood pressure. Medications also help control hypertension. In atherosclerosis, fatty material such as cholesterol accumulates on the artery wall forming plaque that obstructs blood flow. The plaque can form a clot that breaks off, travels in the blood, and can block a smaller vessel. A stroke may occur when a clot obstructs an artery or capillary in the brain. Treatment for atherosclerosis includes medication, surgery, a high-fiber diet low in fat, and exercise. that was a good article.Shows us heaps of information. this is a really good article it helps me a lot to my project. Thanks for osting this article. This has given me alot of information to help me with my project. Please continue to post. This article is good, it helped me in my report.Thanks for it!!! thanks 4 the article..! !keep a good work..!!gambatte..!!! hi this is a good website and i was wondering if you had any information about the skeletal system and the digestive system. if you do can you please send it to my email thanks so much. It helped me for researching. Although it didn't show how the heart, blood, and blood vessels work together for the circulatory system. why should arteries be tough? that was a really great article, really helped me in my project. thx for all the info. whats the anwser for the question i just gave you what are the basic components of a circulatory system? This website is awesome provides everything you need to do. It is perfect for what I teach in class. This article is quite fabulous. It simplified everything to the last bit. I had problem understanding how the atrium and ventricle really works , but not anymore. Thanks a lot.